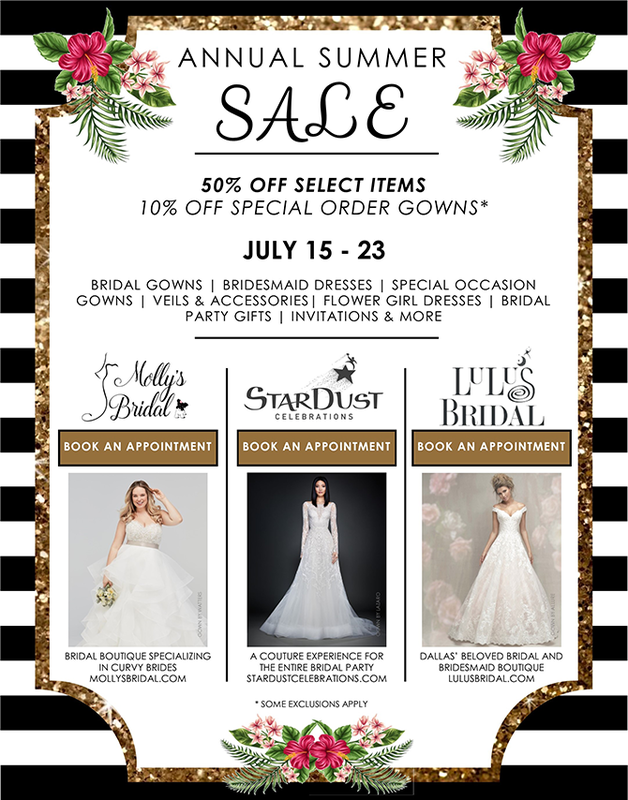 We are thrilled to announce the Annual Summer Sale at our family of stores – StarDust Celebrations, LuLus Bridal Boutique and Molly’s Bridal. Whether you are searching for your bridal gown at a bargain price, a second gown for your reception or deals on dresses for your mom, sister, bridesmaid or flowergirl – one of these locations is sure to have exactly what you are looking for! See below to schedule your appointment at one of these three participating locations! This entry was posted in Sale and tagged bargainbride, bridalgown, bridalsale, bridesmaidsale, lulusbride, mollysbride, nationalbridalsaleevent, specialoccasionsale, stardustbride on July 6, 2017 by admin.